It does not seem such a noble idea now, and the composition itself is tinged with sensationalism and melodrama. 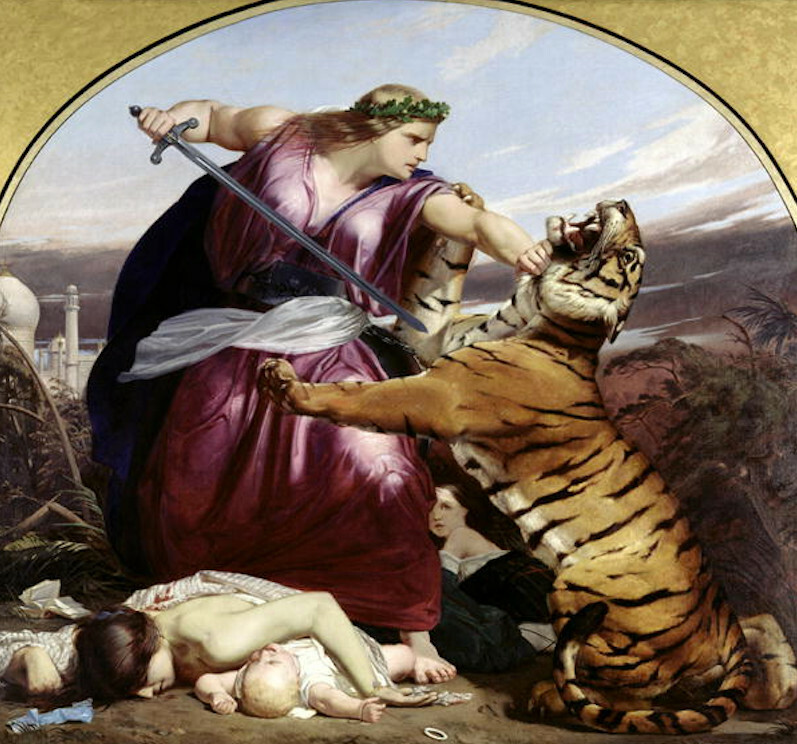 The tiger is obviously about to meet its doom from a furious, intently focused Britannia. However, being at least largely allegorical, it avoids too much graphic detail. The dead woman with her arm protectively over her infant is not too horribly blood-smeared, and the living child crouched fearfully behind them seems fully protected. The damaged book or books, scrap of blue material and bracelet on the ground beside them are the only other signs of the "carnage of war." Alison Smith explains that the composition was probably intended as a fresco for Cuthbert Brodrick's new Town Hall at Leeds. As it was, Armitage (whose family came from the Leeds area) gave the canvas to the town hall. It still hangs in the Queen's Room there. Many thanks to Leeds Art Gallery for permission to reproduce this image. Click on it for a larger picture. Text and formatting by Jacqueline Banerjee. Atkinson, J. Beavington. English Painters of the Present Day. London: Selley, 1871: 19-24. Internet Archive. Contributed by Robarts Library, University of Toronto. Web. 3 February 2016. Smith, Alison. "Edward Armitage (1817-1896), Retribution. Artist and Empire: Facing Britain's Imperial Past. Eds. Smith, David Blayney Brown, and Carol Jacobi. London: Tate Publishing, 2015. 105.